I did some tests with the HiFiBerry Digi prototype today. As expected, everything worked without problems with 44.1/48 and 96kHz. A test with my EMU-0404 showed exactly, what I expected: no digital data could be received over the optical link at 192kHz. It’s not a problem, that’s just what the interface in this device is specified for. Have a look at this oscilloscope picture. You see, that the signal frequency is 12.27MHz. But then I did another test with the optical input of my iMac (an old model from 2009). And I was really surprise to see, that it received correct data even at the highest bit rate! That means, the receiver in this Mac is capable to receive SPDIF inputs of more than 10MHz – nice. What are your experiences with the optical input on your DAC? I’m interested which DACs support this. 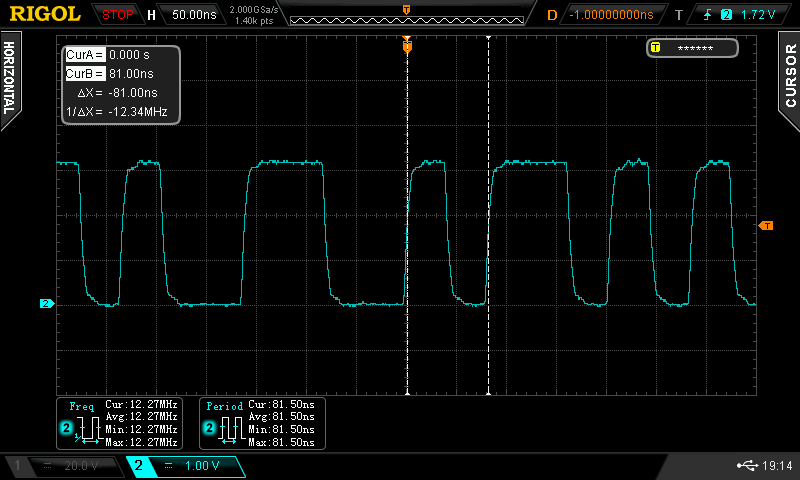 This entry was posted in Projects and tagged measurements, oscilloscope, S/PDIF on December 8, 2013 by Daniel.